A wide-eyed view of the Red Desert. This is about one of those places in Wyoming that is wonderful, and being destroyed by the gas industry, while Governor Freudenthal diverts attention to 150 or so wolves that wander a small part of the state near Yellowstone. A wide-eyed view of the Red Desert. If more people see it, naturalist contends, they will be compelled to save it. AP in the Billings Gazette. Photo copyright Ralph Maughan. 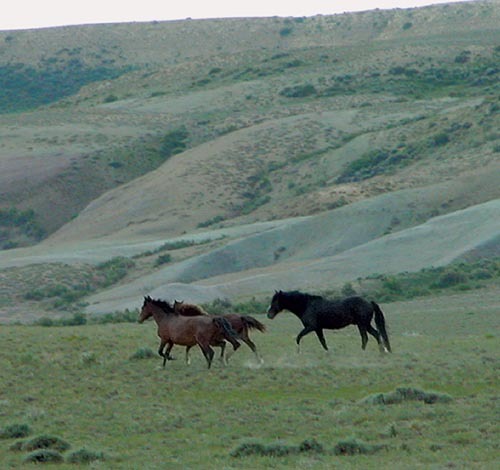 Wild horses beneath Bush Rim in the Red Desert. I visited in 2004 because I heard the area would probably be destroyed. It was a beautiful high desert. Nearby wildlife, in addition to the horses (in July) from Bush Rim, where I camped, I also saw elk, deer, and pronghorn, including one huge bull elk. Nationally, few people know about this desert elk herd. 2 Responses to A wide-eyed view of the Red Desert. I tried to visit the Red Desert area after a Yellowstone trip in spring of 05. I drove up from the south but the stinch of gas and the roads destroyed by semi-trucks turned me around in less than ten miles. I would still like to visit. What is the best way to get in? I came in from South Pass and drove south. There were no wells for about 30 miles.